Spring has sprung, yet some clouds still hang over the markets. 1. Cloudy forecast: U.S. stock futures are sinking a bit and many European markets have turned negative after starting in positive territory. Asian markets ended the day with modest losses. Investors are generally shrugging off the hijacking of an EgyptAir A320, which ended with a suspect in custody and all passengers released. Airline stocks mirrored the broader market. Investors are also looking ahead to a major speech from Fed chair Janet Yellen, who is scheduled to appear at the Economic Club of New York at 11:30 a.m. ET. 2. Stocks to watch -- Apple, Yahoo: Apple (AAPL) is in focus after the Department of Justice dropped its high profile case against the iPhone maker. The DOJ was trying to force Apple to help law enforcement officials break into a terrorist's phone. Apple had declined to provide assistance, saying it would ultimately compromise the security of all iPhone users. Yahoo (YHOO) is in the spotlight after the Wall Street Journal reported that the company is asking prospective bidders to put forward initial offers for its core Web unit and Asian assets by April 11. 3. Economics: The Case-Shiller housing index for January will be released at 9:00 a.m. The index gives a good overview of housing dynamics in 20 key U.S. cities. Then the Conference Board is releasing data on consumer confidence at 10:00 a.m.
4. Monday market recap: It was a relatively uneventful trading day on Monday, and European markets were closed. 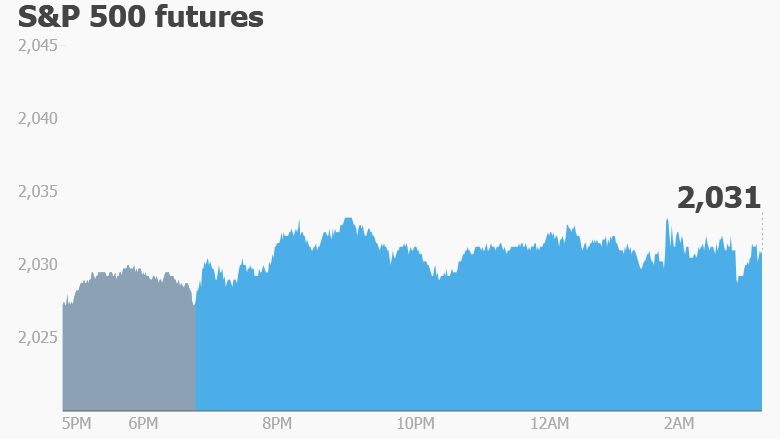 The Dow Jones industrial average and S&P 500 edged up by 0.1%. The Nasdaq dipped by 0.1%.